Can you pack for a two week holiday with just hand luggage? This post about travelling with hand luggage was created in collaboration with Admiral Travel Insurance. 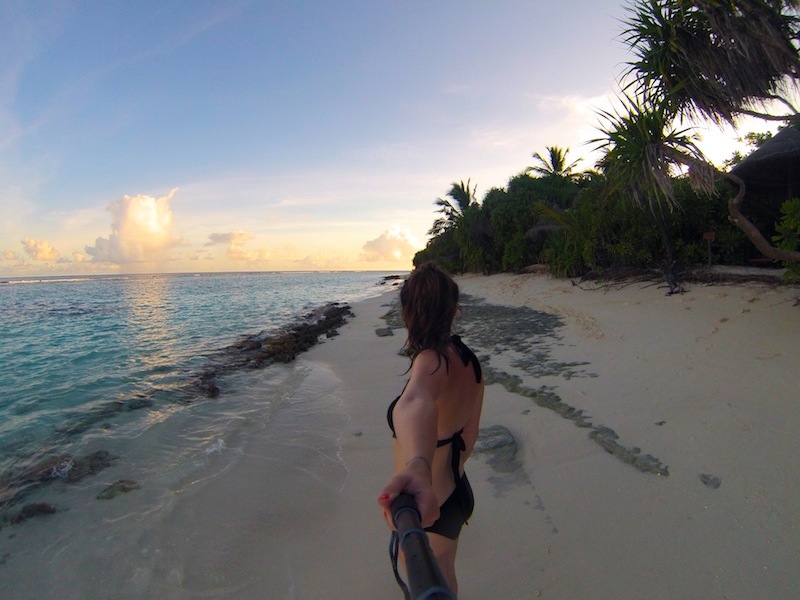 Travel insurance is something you should never travel without no matter where you’re going! 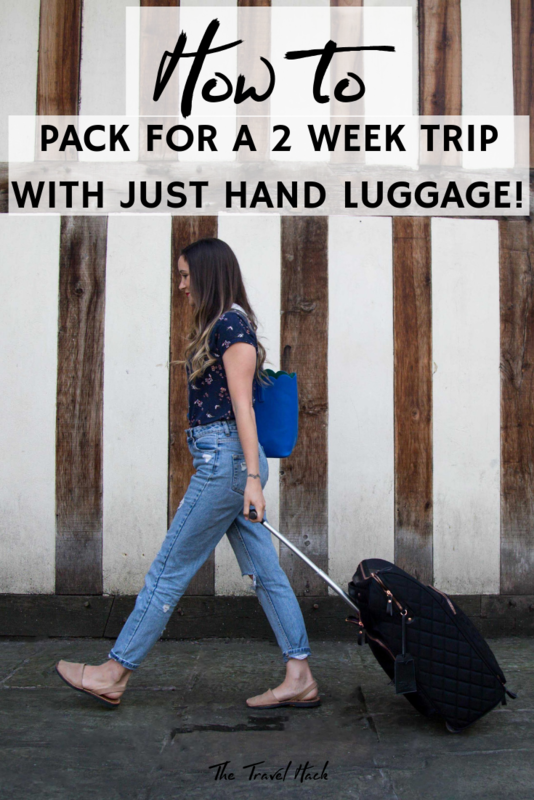 Two weeks away with just hand luggage sounds like a challenge but it’s more than possible if you follow these easy travel hacks! Travelling with just hand luggage is all about removing the ‘just in case’ items, minimising, planning and learning how to pack efficiently. So keep reading if you’re taking a two week holiday with just hand luggage! First of all, you’ll need the perfect luggage that’s the exact dimensions for cabin baggage for the airline you’re flying with. Most airlines allow roughly the same size (55cm x 45cm x 25cm) for their hand luggage so you won’t need to buy different luggage for every flight you take! Surprisingly, most small suitcases aren’t the best fit for hand luggage as they’re often a bit too wide and not tall enough. Cabin baggage should really be tall and slim to maximise the dimensions you’re allowed and most people are surprised to find that the 55cm x 45cm x 25cm size is actually really big and more than enough space for a 2 week holiday with just hand luggage! 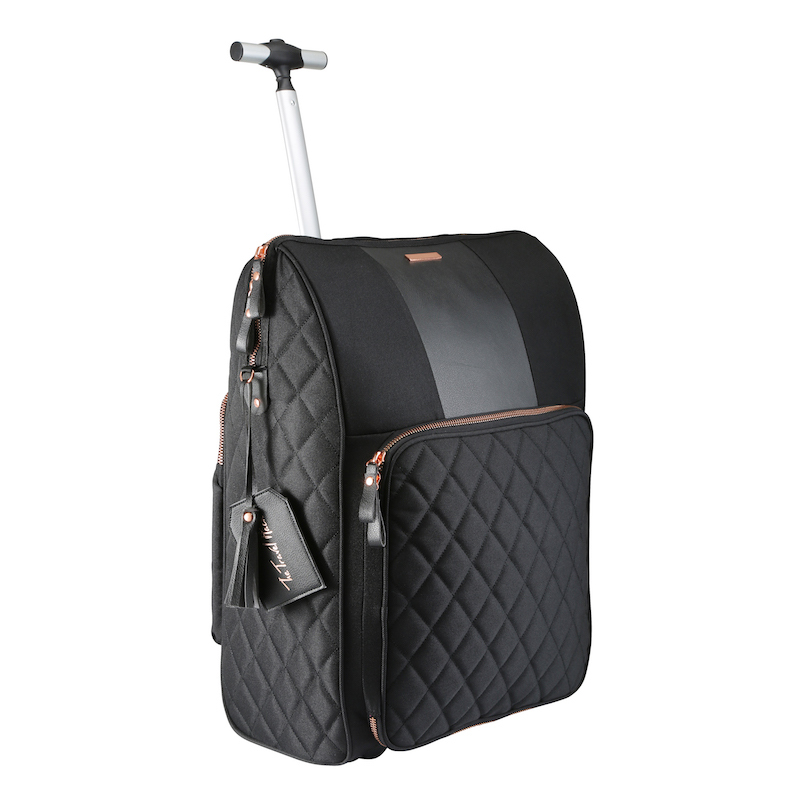 Of course, I’m going to suggest The Travel Hack Pro Cabin Case which will be back in stock soon! Should you worry about your hand luggage weight? Some airlines don’t have weight restrictions when it comes to hand luggage and simply ask that you should be able to lift it into the overhead locker yourself. Other airlines do have weight restrictions but, realistically, they often don’t weigh your case unless they can clearly tell it’s extremely heavy. My advice is to try and loosely stick to the weight restrictions but be aware of your heavy items in case you need to remove them. If your toiletries are heavy, it’s often cheaper just to ditch your shampoo and conditioner and pick a new bottle up when you arrive. For me, it’s usually my laptop and camera adding the weight and most airlines will allow you to carry a laptop onboard, so I’ll just remove it and carry it under my arm, which most air stewards don’t even notice! When travelling with just hand luggage you’ll be restricted to liquids in 100ml bottles. It doesn’t sound like a lot but I’ve found 100ml of shampoo, conditioner, face wash, shower gel etc is more than enough for two weeks. Do you really need those shoes? Shoes are the biggest problem when you’re travelling with just hand luggage because they’re so bulky! So ask yourself if you realistically need those shoes? I often won’t pack any shoes and find I’m happy to wear the same pair all week. It can mean my shoes are a little casual for nights out but I often travel with my kids so it’s not like I’m going clubbing anyway! I’m currently loving chunky white trainers and find they go with pretty much anything I’m wearing. If you can’t do without high heels or chunky boots then wear these on the plane to save space in your case. The trick to not packing too many clothes is planning a rough itinerary for your trip and thinking about your outfits for each day. 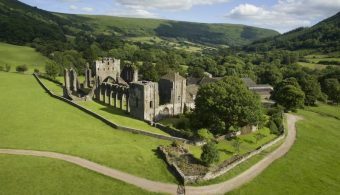 If you don’t know what you’ll be doing during your holiday it can be tempting to pack everything for every ‘just in case moment’ that could arise. But if you know what you’re doing, you’ll know exactly what you want to wear and can pack accordingly. Packing a minimal, capsule wardrobe is key so this means putting together outfits where every item can be mixed and matched together to form other outfits. If you’ve got a skirt that only goes with one top then leave it at home and choose a skirt that could be teamed with four tops in your case. 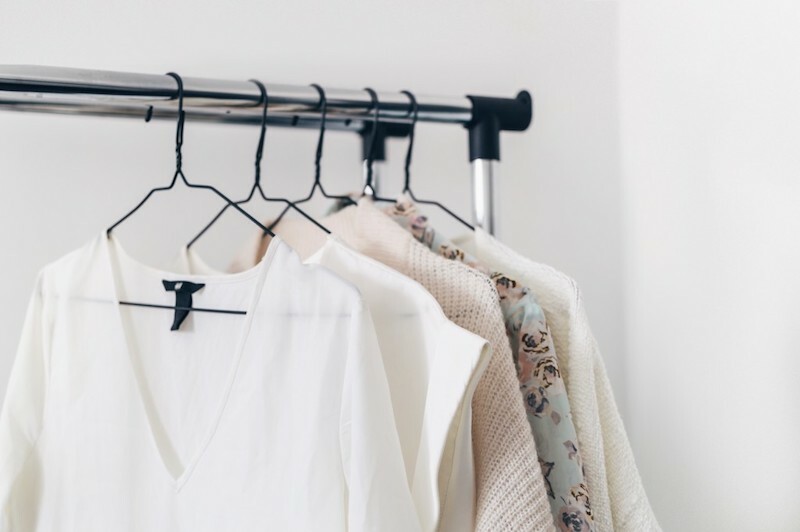 Capsule wardrobes don’t need to be boring, dull or all black, white and grey. It does help if you choose a neutral palette and use small accessories to add colour. Would anyone notice if you wore the same jeans for 50% of your holiday? Probably not. More importantly, would anyone care? Definitely not! You’re on holiday, it doesn’t matter if you end up wearing the same jeans nearly every day and it’ll give you a lot of space in your case for tops! Reversible clothes are your friends! While doing your holiday shopping be sure to look out for reversible clothing. I have a reversible winter coat which is amazing and reversible swimwear is easy to find. If you haven’t tried packing cubes yet I highly recommend them! They’re such an easy way to compress your clothes without creasing them too badly and to organise your suitcase neatly. I’m always surprised by how much space I can save by using packing cubes. If you’re staying in an apartment or an Airbnb there will probably be a washing machine available so make the most of it! You don’t need to pack every item of clothing you own, just pack a few things and wash them while you’re out there. If you’re travelling with kids and think it’s impossible to go away for a week with just hand luggage then think again! Sam and I have done it a few times! Our kids are too young to carry their own luggage so we’ll take a backpack and a suitcase each so we can carry all four bags between us. But you very rarely need to carry them anyway because the airline staff will usually let you check them in free of charge. We usually have pushchairs and car seats too which you need to check-in, so while you’re there just ask the staff if it’s OK to pop your hand luggage through at the same time. They’re rarely say no if you’ve got young children with you. Just remember to have all your in-flight stuff easily accessible so you can whip it out while you’re at the check-in desk. I wouldn’t normally advise checking your luggage in voluntarily because you then need to wait for it to come through on the luggage belt, but when you need to wait for a pushchair and car seat anyway, you might as well wait for your suitcases too. When it comes to nappies and wipes, remember you can buy them when you arrive. If the country you’re visiting has babies, they’re going to have nappies and you’ll find Pampers in most countries (although sometimes they have a different name). Layer up for the plane! If you’re still finding you’re short on space then don’t be afraid to layer up for the plane. OK, you’re going to have a hot and sweaty 15 minutes as you queue up to board but you can remove all your layers as soon as you sit down. I’ve been on skiing holidays with just hand luggage and had to wear so many bulky layers to get on the plane because I couldn’t squeeze everything in my case! Travel insurance documents – I’m an Admiral Travel Insurance ambassador because it’s something I feel so strongly about and I’d never travel without it. Canvas tote bag – I always take a little bag for the things I want on the plane such as my Kindle, water, phone and headphones. I have this canvas backpack from Lands’ End (gifted) and it’s perfect. Where are your shoes from in the photo ? They’re from FatFace. They’re Menorcan sandals and I LOVE them. I had these ones for two years and wore them every single day it was warm enough. They’re so comfy! I’ll be buying some more from FatFace again this summer, I think they stock them every spring season.